It won't take you long to figure out that Joey Hewell, owner of J. Salon and Studio, is one creative dude. Just stand outside of his NoDa home/salon and take in the sights. Some call it a sanctuary; others call it a whimsical abode. Then, there are those that call it home - for their hair. 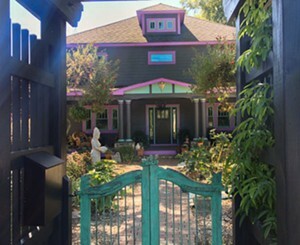 Make your way into the beautifully restored, colorful home where Hewell will give you the best haircut and color ever. He styles models and is a creator behind Charlotte's coveted fashion event, Front Row. The havoc your hair is wreaking? No biggie.